This weekend was just beautiful in Dallas! On Saturday, I sat outside with a few friends to enjoy some live music and the stunning weather at The Rustic. It hovered around 70 degrees, and there wasn’t a single cloud in the sky. We’ll be getting another cold front this Thursday, but luckily I’ll already be enjoying the fine Cali weather by then. Before the sun came out this weekend, we’d been experiencing day after day of frigid, icy weather around here – the one big benefit of this? Getting to pull out my faux fur Zara coat that I bought over four months ago. I almost forgot about it, actually. It’s the coziest coat I have – soft, heavy and definitely winter ready. I wore this look to happy hour with two of my girlfriends last week – it transitioned from day to night seamlessly. Another steal featured in this look is this striped Vince sweater, currently on sale! It’s a great neutral basic, but it’s not boring. You could consider me a collector of Vince sweaters – I have some Vince sweaters from college that I still wear year after year! They are such high quality pieces that really do stand the test of time. That’s why when I find a good one on sale, I snag it. A few other sweater styles I’m loving that are marked down include this classic dolman-sleeve sweater, this superwash striped knit and this thermal v-neck. It’s always a good time to stock up on cashmere! What a great coat and I love your skinnies. 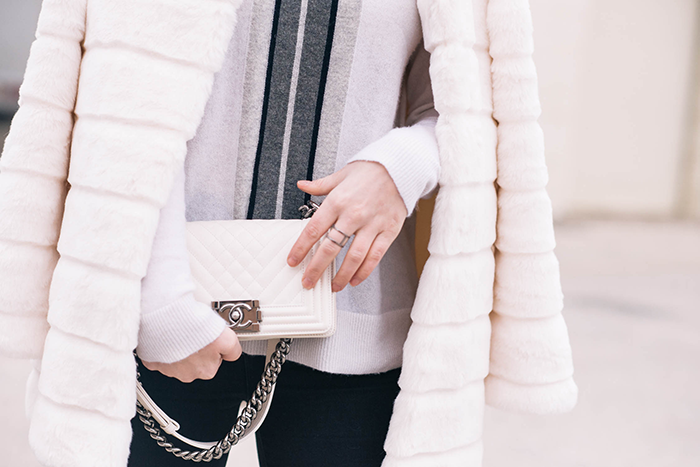 Love the coat and your Chanel! Love this coat! What a great Zara piece. And your Chanel is gorgeous! Love this classic yet trendy look. The black and white makes such a great statement. I love how the coat adds great texture. You are killing it with the black jeans lately. Looking every inch like a star in fur!!! That coat is so simple and chic. Perfectly polished for work and sophisticated and edgy for dinner! Is that coat as soft and cuddly as it looks?? Beautiful! Such a beautiful coat! Sounds like you had a great weekend, too! I am so envious of your coat and bag – beautiful choices! Ahhh that coat is beyond GLAM! Love. I love that faux fur coat! I’ve been looking for a similar one because it really is one of those pieces that make transitioning from day to night so much easier. I also really love those boots! This coat is too glam! I adore it! And I love that you paired it with simpler items! I love everything about this outfit Merritt, that jacket is a fabulous find!! That is so true about Vince sweaters, I just swear by them. They are my absolute favorite..I wear them day in and day out, from a night out to a lazy day at home. So smart to try to scoop them up when they are on sale. Also a bit random probably – but your hair has been looking wonderful in your posts lately! Maybe one day you can share your favorite tips and products with us! You look great! I love the coat and Chanel bag. And I wish I was headed to Cali by Thursday, to avoid the change in weather, these last few days have been nice. I’m obsessed with your boy bag! Love it! Also, the Vince sweater looks great with your faux fur from Zara. Super chic! Love this look! 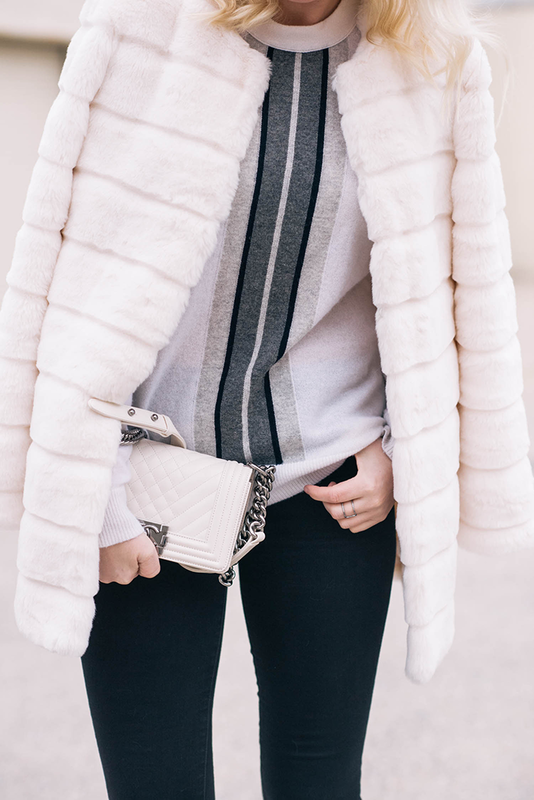 Obsessed with white for winter! Fab, as always! love these light colors with your hair!!! That jacket is major. Love this look for Texas winter. Love that jacket! So fantastic. And the sweater is gorgeous too! Loving this look. Everything matches so perfectly as always. that coat was such a great find!! Such a perfect black + white look! Love the booties and those jeans fit you like a glove.